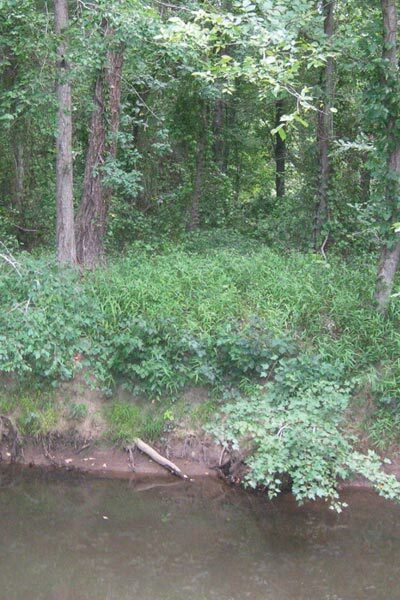 Riparian sites are usually adjacent to rivers and waterways with soils often containing clay, high amounts of organic matter and/or saturated sand. 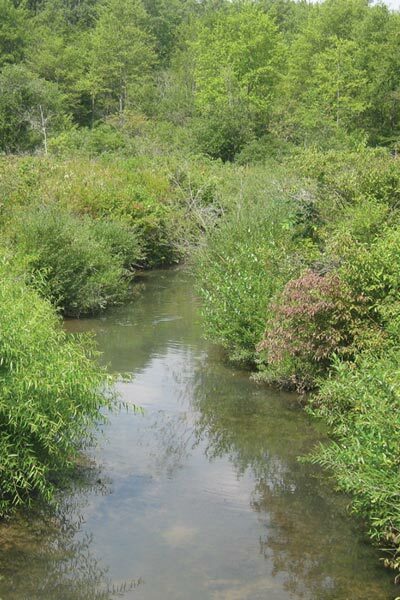 Examples include river and streambanks or damp floodplains of rivers and streams. Varies from partial shade to full sun; subject to flooding; generally occupied with FACU, FAC and FACW species. Hand seed, broadcast seed or hydroseed. Eradicate existing invasive vegetation by having a licensed spray technician apply an approved herbicide, such as glyphosate (Rodeo®), triclopyr (Garlon® 3A) or a similar aquatic herbicide formulation, to control undesirable vegetation, such as multiflora rose, honeysuckle and woody species. CAUTION: Some persistent species, such as purple loosestrife, phragmites or reed canarygrass may need multiple applications of glyphosate or triclopyr. Perennial weeds not addressed before establishment will be difficult to remove later. Before seeding, excess dead vegetation should be turned under or burned if conditions permit. 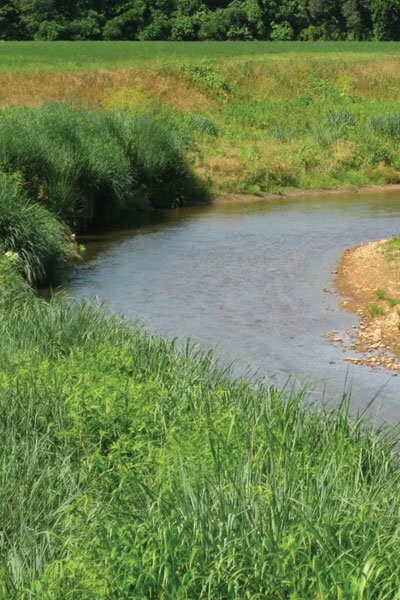 Newly constructed riparian sites should be seeded as soon after construction as possible. Whenever canopy (overall vegetation) reaches a height of 18”-24”, use a brush hog mower or string trimmer to trim the meadow to a height of 8”. (Note: A lawn mower is not recommended as the mower height will be too low and native seedlings will be killed). This will reduce competition by fast-growing weeds for sunlight, water and nutrients needed by slow-growing perennial natives. If bioengineering materials are used on the site, mowing should be above the new growth of these materials. Mowing should cease by mid-September. Problem weeds should be hand pulled or spot sprayed with an approved herbicide formulation (such as Rodeo® or Garlon®3A). Prior to new spring growth reaching a height of 2” (e.g., shortly after forsythia or redbud blooms), trim any material standing from the previous year close to the ground (approximately 2”). This will allow the soil to warm more quickly, which will stimulate the emergence and growth of native seedlings and reduce the likelihood of the meadow being invaded by shrubs. If bioengineering materials were used on the site or seed of shrubs/trees were part of the mix, the site should not be trimmed after the establishment year. Problem weeds should be hand pulled or spot sprayed with an approved herbicide. If you notice a heavy infestation of ragweed or foxtail in the second growing season, trim the meadow to a height of 8”. Trimming should cease by mid-September. 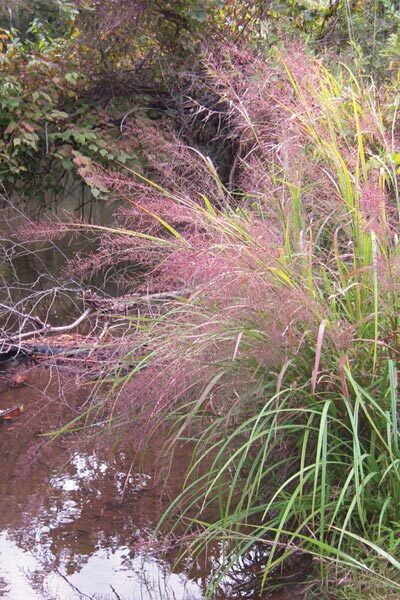 Grassy weeds or persistent perennials can re-establish in this type of soil. Monitor and control weeds by hand pulling or spot spraying. DISCLAIMER: The information in this review of practices is the result of more than 50 years of experience in seed production. Ernst Conservation Seeds has been supplying seeds and consulting in the reseeding of tens of thousands of acres of roadsides, surfacemined lands, conservation and restoration sites in eastern North America, as well as growing and supplying seed and consulting in the planting of hundreds of thousands of acres of CRP/CREP-related areas for erosion control and wildlife habitat. All of these practices are opinion only and our best advice as a result of these experiences. These recommendations do not cover all of the conditions that will be encountered in the field. All of the information is for individual consideration. Ernst Conservation Seeds is not responsible for conditions that will be encountered in individual situations. The use of brand names does not represent our endorsement of a specific product; rather, it represents our experience only and has not necessarily been replicated in peer-reviewed research. The use of chemical pest control agents is subject to manufacturers’ instructions and labeling, as well as federal, state and local regulations. The following mixes are good for vegetating riparian corridors or floodplains. The species in these mixes provide food and/or cover for insects, birds and other animals.